Aurapharm.com is an online drugstore based in the United Kingdom that has been offering pharmaceutical services since 2002. Aura Pharmaceutical Specialties only deals with brand medications which are sold at lower prices than what they will cost in local pharmacies. These medications are sourced from reputable manufacturers located in different parts of the globe. The medications stocked at Aura Pharmaceutical Specialties are divided into various categories which include Antidepressants, HGH, Birth Control, Antipsychotic, Anti-Asthmatic, Antibiotics- Antiviral, Dopamine Agonists, Men’s Health, Pain- Migraine, Smoking Aid, Mood Stabilizers, Obesity/ Weight Loss, Acne Treatment and MAO-B Inhibitors. No prescription will be required to purchase any of the medications in these categories. I searched through the erectile dysfunction category to know the medications that are in stock. Some of the medications in this category include the brand Viagra where 4 pills will be sold at $80, Cialis 20mg where 2 tablets will be sold at $60. I find this price too high compared to the prices of similar medications in a local pharmacy. The other ED pills include Levitra, Afilta-Cialis, and Vigrande Sildenafil. There are other popular medications that have been displayed on the homepage which include Roaccutane, Cabraser, Modiodal, Cymbalta, and Arimidex. To pay for your medications at aurapharm.com, you can use a visa card or a mastercard. Discover cards, Diners Card and other cards that are not listed on their website are not accepted for use during the payment. If you wish to cancel your order, you should do this within 24 hours after placing the order before the dispatch of the order. The shipping of the medications purchase will cost $20 across the globe but if the order is valued at over $250, the shipping fee will not be charged. The shipping will take a maximum of 21 days to be delivered but this may be delayed by customs check or unfavorable weather conditions. It seems the registered airmail method is the only available means of shipping and this is why it is impossible to get the medications delivered faster. If after the delivery of the medications you are not satisfied with them, you should notify Aura Pharmaceutical Specialties immediately. You will be given the permission to return the medications if you have not tampered with their original package. If you wish to contact Auropharm.com, you will send an email and you will be contacted before the end of 24 hours. I could not find a contact number that one can use to make a call or even the option of a live chat. This means that it will not be possible to get an immediate response if the need arises which is not a good option for the customers who will be making their purchases. There are a number of reviews about Aura Pharmaceutical Specialties some of which are positive while others are negative. Majority of the customers agree that the quality of the medications sold is very good. The problem comes when you wish to communicate with Aurapharm.com since they either take too long to respond to an email or do not respond at all. Others complain of the delivery taking too long or the medications failing to be delivered. Daren is one of the lucky customers who has had a great experience when buying her medications at aurapharm.com. She says that at times, they will refuse to accept payment by use of a credit card while at other times they will be very poor in communicating. She adds that despite these problems, she always gets her medications on time. Her advice to anyone seeking to buy medications from Aura Pharmaceutical Specialties should check with them first before placing the order. Z sent in his order to aurapharm.com and the value of the medications deducted from his credit card. He says that since he placed the order 45 days ago, Aura Pharmaceutical Specialties has not contacted him and his attempts to enquire what happened has not been answered. He says that this is a total rip off and anyone seeking for a reliable source of medications should keep off from aurapharm.com. Jack has been buying from Aura Pharmaceutical Specialties for the past 3 years and he says that the quality of the medications is better compared to what other online pharmacies offer. He says that anyone seeking to buy medications from them has to order in advance since they take very long to deliver the medications. He argues that this is because of the distance from which the medications are delivered. 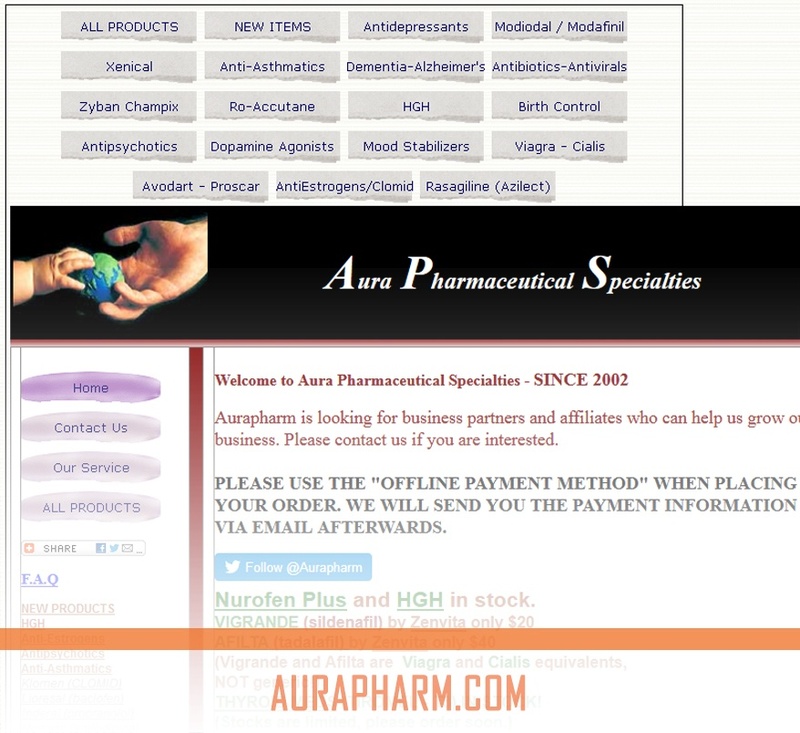 Despite the delays, he recommends anyone seeking to purchase medications online to consider Aura Pharmaceutical Specialties. The most recent reviews about aurapharma.com are mixed as well. Both customers have been buying from aurapharm.com for a while and agree that the delivery of the medications takes too long though the quality is very good. However, in the recent past, their communication has become a problem and one of the customers is yet to receive his order. Hardwood says that he placed an order at Aura Pharmaceutical in the past but it was not delivered. The recently contacted him asking him to place an order but because the previous order was never delivered despite paying for it, he told them he would not place an order until the issue is resolved. He got his pending order delivered and he says the medications are effective and the price is very good. Consmutto has also been a customer for a while until recently when he made an attempt to place an order and failed. He also says that he tried sending an email but there was no response. 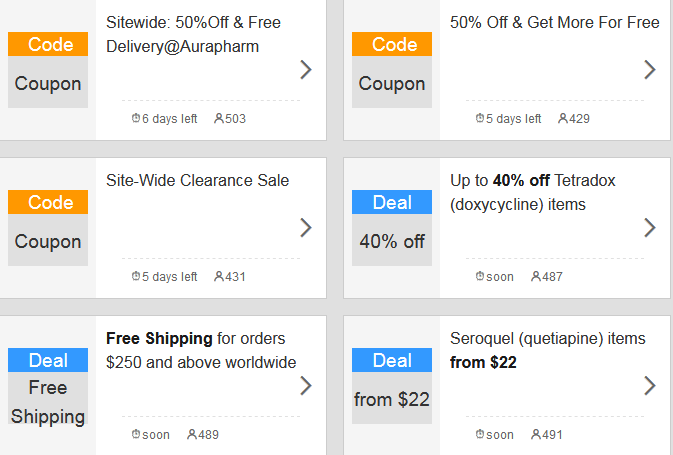 There are several active coupon codes that will help in lowering the cost of the medications at aurapharm.com. Most of the medications are being sold at a discount of up to 50% for a specified duration of time. For all orders that will be over $250, the shipping will be free. 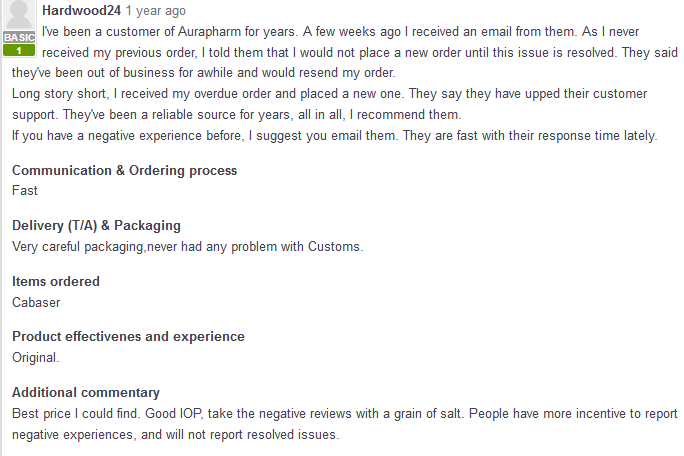 Aurapharm.com seems to have been a great online pharmacy that has ruined its reputation in the recent past due to lack of communication and taking too long to have the medications delivered. Even the customers who are not happy with the services agree that the quality of the medications is the best if only Aura Pharmaceutical Specialties would keep their end of the bargain by responding to customers’ emails and delivery the orders on time.